Suzanne Woods Fisher’s The Calling Giveaway! Welcome back to the Inn at Eagle Hill. Bestselling author Suzanne Woods Fisher‘s newest book in the Inn at Eagle Hill series, The Calling, is filled with romance, family secrets, and characters who are searching for fulfillment in their lives with some unexpected results. Fisher has written a believable story about those who embrace their flaws. 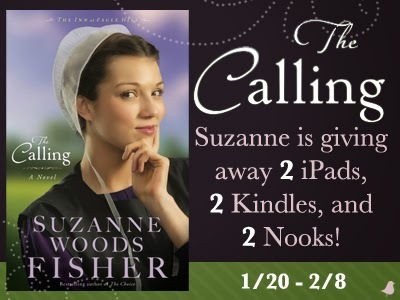 Suzanne is celebrating the release of The Calling by giving away TWO iPads, TWO Kindles, and TWO Nooks!